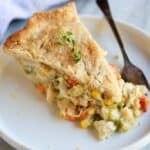 Homemade Chicken Pot Pie could be the king of all comfort foods, and this homemade version is a guaranteed family favorite! 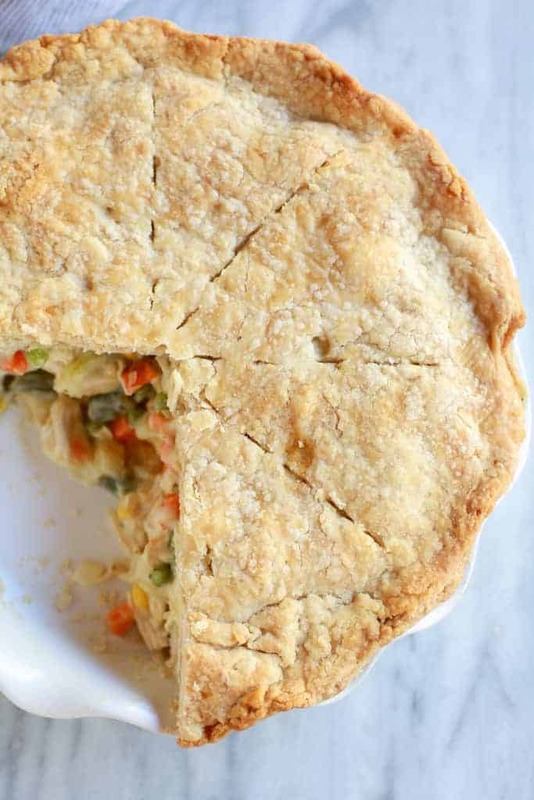 I use a homemade pie crust for my chicken pot pie, but a store-bought crust would also work. Then, fill the pie crust with a delicious and easy-to-make creamy chicken and vegetable filling. This recipe for homemade chicken pot pie is an absolute treasure in our house! I first shared it on the blog back in 2013, but it was in desperate need of a makeover, so I’m excited to re-share it with you all again today! I fear it’s one of those recipes the world forgot, and it deserves a place in the limelight! I found the original recipe several years ago on all recipes, and have made some updates to it over time to make it really fantastic. Chicken Pot Pie is a true classic that tastes best on those cold days where you just need something warm and comforting! 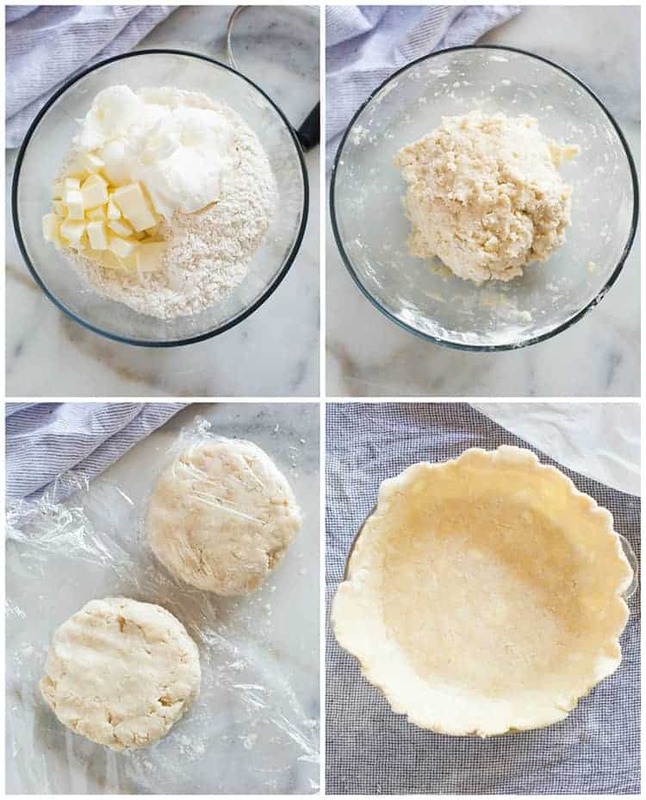 I use homemade pie crust for this recipe, since I usually have some on in my freezer. You can use a store-bought pie crust if you want, but watch the cook time because the store-bought crusts are thinner and will brown faster. You may want to cover the crust with tinfoil part way through baking. 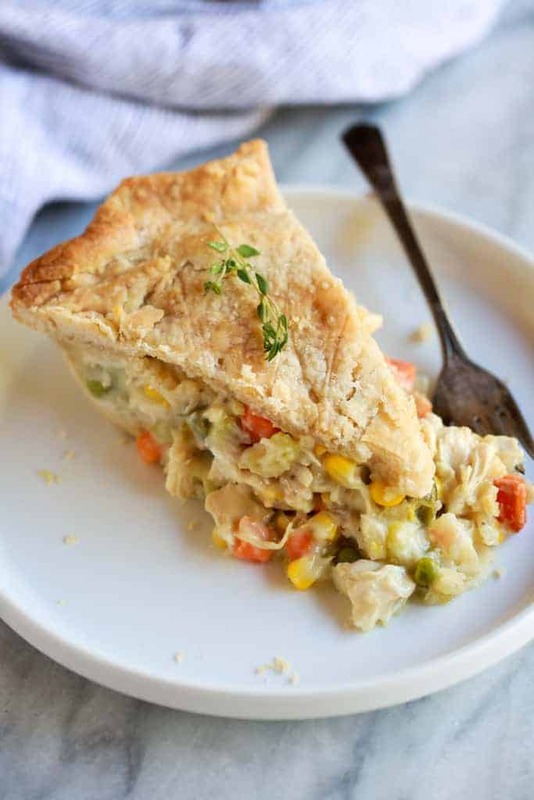 To make a homemade crust for chicken pot pie, combine the flour and salt in a medium size bowl. Add the shortening and butter and use a pastry blender to cut everything together until the mixture resembles fine crumbs. Add ice water, just a tablespoon at a time, until the dough begins to clump together. Form the dough into two balls and chill in the refrigerator for about 2 hours. I have the BEST trick for rolling out pie crust, here. Season the chicken with salt and pepper and add it to a saucepan. Add enough water to the pot to cover the chicken, then bring it to a boil and cook until the chicken is just barely cooked through. Remove the chicken to a plate and reserve about 1 3/4 cups of the water from the pan, before discarding the rest. In another saucepan, cook the onions and celery in butter. Add the flour, salt, pepper, garlic powder, bouillon paste, and celery seed. Stir in the reserved water from the pot, and milk. Simmer the mixture until it thickens. Chop the chicken and add it with the frozen vegetables to the hot mixture. Cook until the veggies are warmed. Taste the mixture and add more seasonings or chicken bouillon, if needed. Pour the mixture into your prepared pie crust and cover with the top crust. Prick a few holes in the crust and bake the pie for 30-35 minutes. Can I make chicken pot pie ahead of time, or can I freeze chicken pot pie? 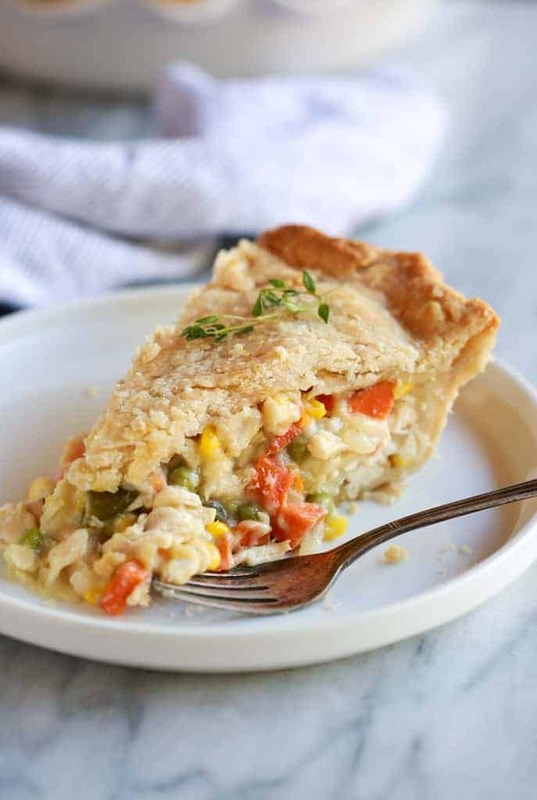 The filling for chicken pot pie can be made 1 day in advance; cover and chill in the refrigerator. Fill your crust and bake the next day, as directed. The unbaked OR baked pot pie freezes well for up to 2-3 months. Allow it to thaw overnight in the refrigerator and then bake as directed, or bake to warm through. Leftover Chicken Pot Pie will last in the fridge for up to 5 days, stored in an airtight container. 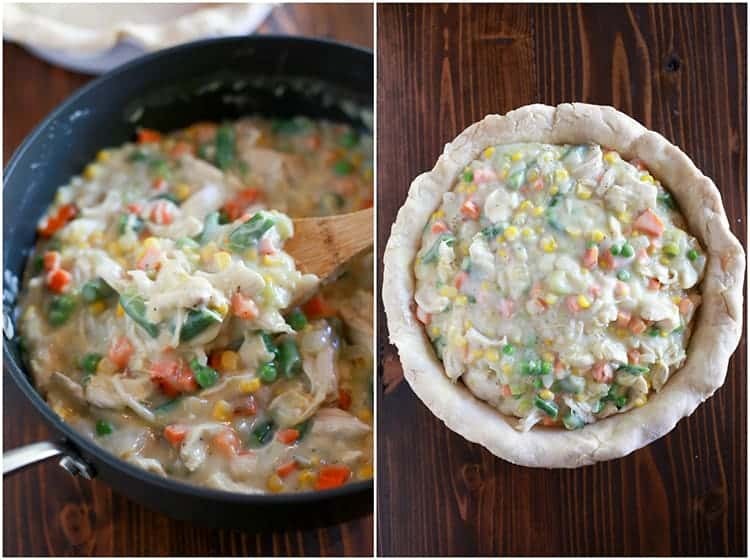 Homemade Chicken Pot Pie is a guaranteed family favorite, made with homemade pie crust and a creamy chicken and vegetable filling. Season chicken with salt and pepper. Add the chicken to a large saucepan and cover it with water. Bring to a boil and cook for 6-10 minutes or until the chicken is just barely cooked through. Remove the chicken to a plate, reserve about 1 3/4 cups of the water in a measuring cup, and discard the rest. Add onions, celery and butter to the saucepan and cook for a few minutes, until soft and translucent. Stir in the flour, salt, pepper, garlic powder, bullion paste and celery seed. Slowly stir in the reserved water and milk. Simmer over medium-low heat until thick. Chop the chicken and add it to the pot along with the frozen vegetables. Taste and season with more salt, pepper, bullion or garlic powder if needed. Pour mixture into bottom pie crust. Cover with top crust, seal edges, and cut away excess dough. Make a few small slits in the top crust to allow steam to escape. Bake for 30- 35 minutes, or until pastry is golden brown and filling is bubbly. If you find the pie crust is browning too quickly, cover it with tinfoil. Cool for at least 15-20 minutes before serving to allow it to set up. *Nutritional information does not include pie crust. (calories vary for homemade or store-bought crusts). *I originally shared this post in October 2013. Updated October 2018. I’m not giving this a number of stars because I changed it too much. But I must say I’m happy to see you recommend using Better Than Bouillon. It is always way better than a regular bouillon cube. I used your base recipe but was getting ready to leave for vacation and used what I had in my refrigerator. This pot pie is awesome. I didn’t change a thing. Yuummo! Thanks for taking the time to comment and for the 5 star rating! Glad you enjoyed the recipe!